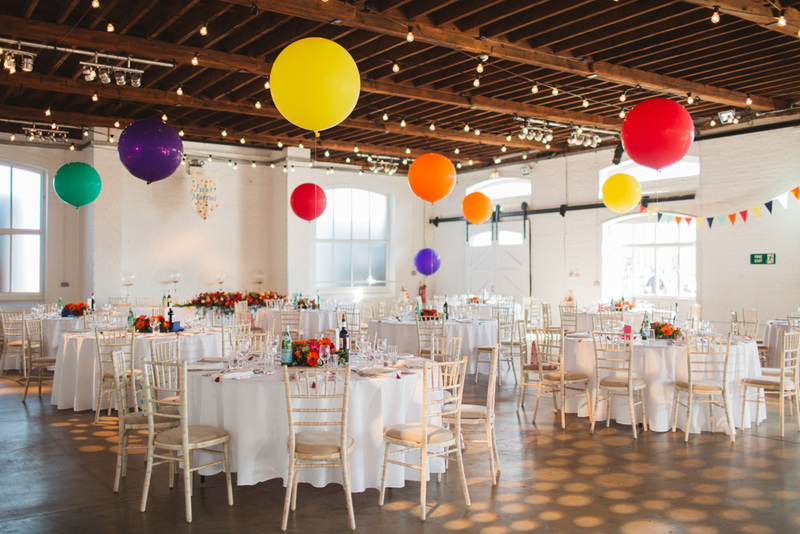 This modern warehouse wedding London is a great example of how to save on certain parts of your wedding when you’ve blown the budget on others. 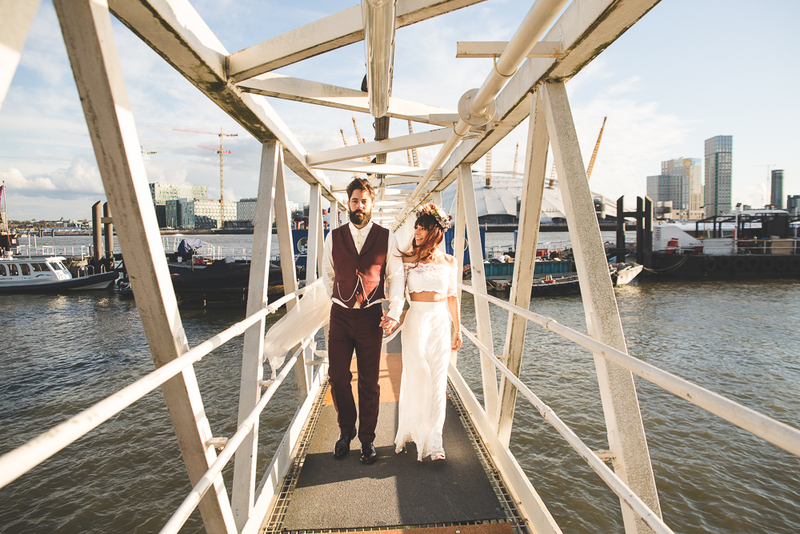 Cantara & Michael found their perfect wedding venue, RMW fave Trinity Buoy Wharf in London and overspent to secure it. They were thrifty finding suits and bridesmaid dresses in the Boohoo sale (at £25 each!) and made elements for the day themselves to compensate. The overall look is certainly not compromised. 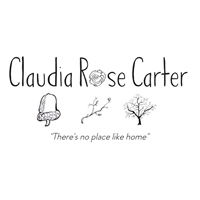 We are so glad we could give you the inspiration you needed to create your perfect day. 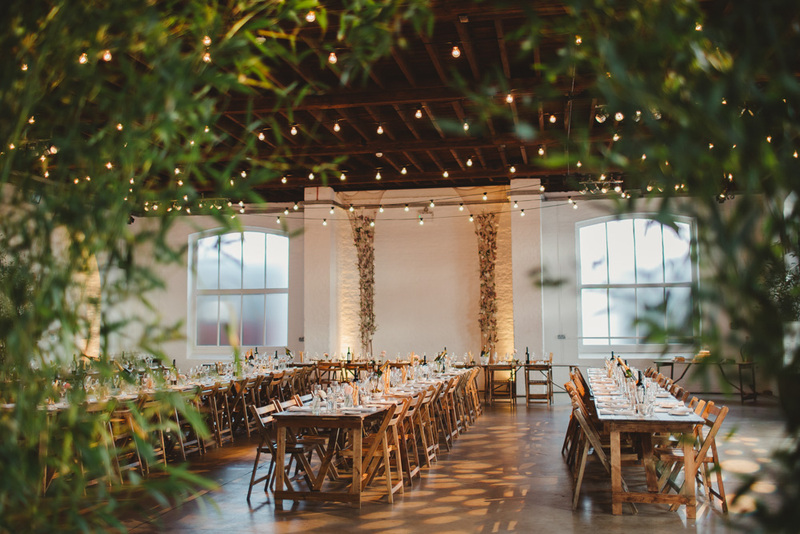 We’ve featured many a gorgeous wedding at dry hire wedding venue Trinity Buoy Wharf in London, you only have to search our archives to see all the fabulous ways our couples have decorated it. 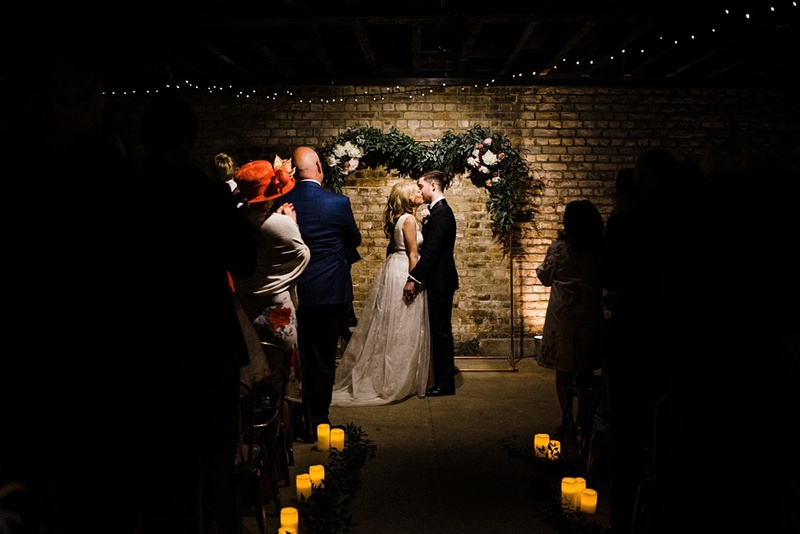 Kiera and Adam used the whole venue, having their civil ceremony in The Electricians Shed and their reception at The Chainstore. 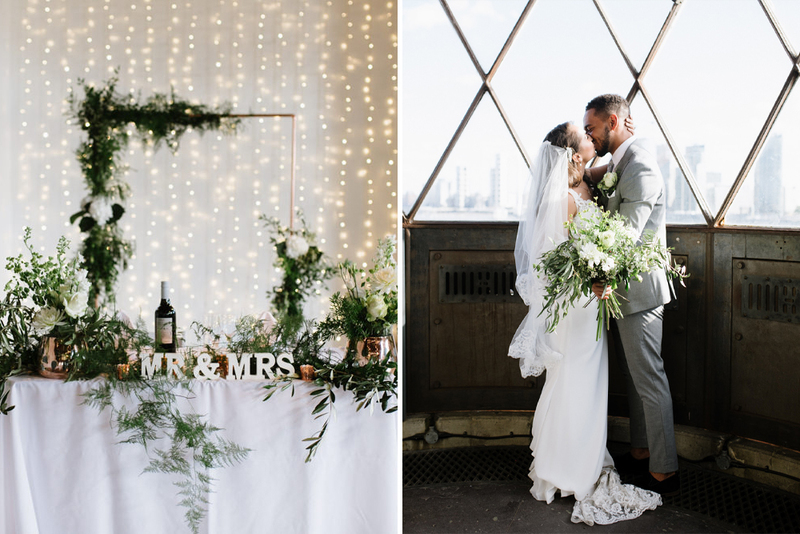 They filled both spaces with an abundance of fairy lights, floral garlands, and fabulous decor with everything planned to perfection by Utterly Wow. There are weddings and then there are WEDDINGS and this massive party at Trinity Buoy Wharf definitely falls into the second category. From start to finish it’s clear that everyone is having a ball, Kerri’s smile doesn’t leave her face for the whole day! Exactly as it should be. Trinity Buoy Wharf weddings really are the best. 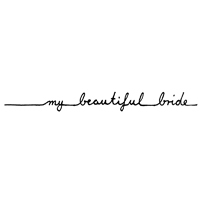 It’s such an incredible blank canvas, with every wedding we feature from there so different. 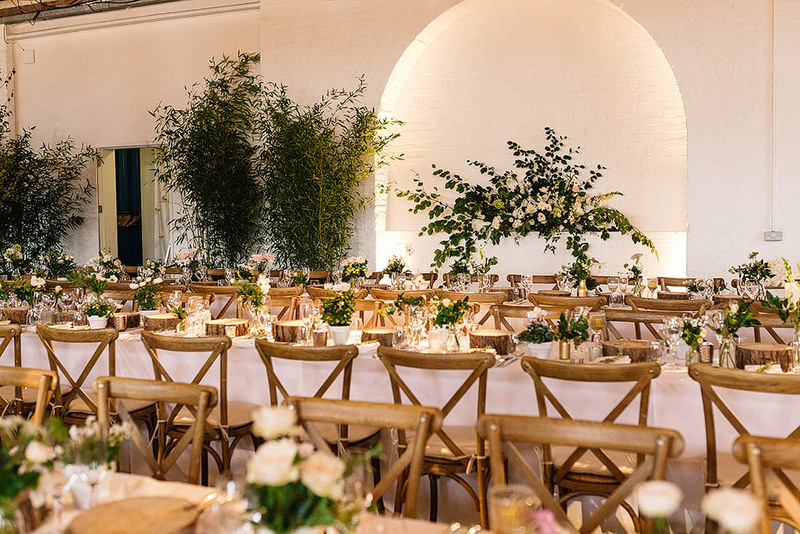 Plus it’s right on the Thames with beautiful views of the city and enough exposed brick and quirky details to keep every industrial loving bride truly happy. Paula and Geoff almost didn’t get married here, as you’ll read in the wedding report, but we’re glad they did, and I think they are too! 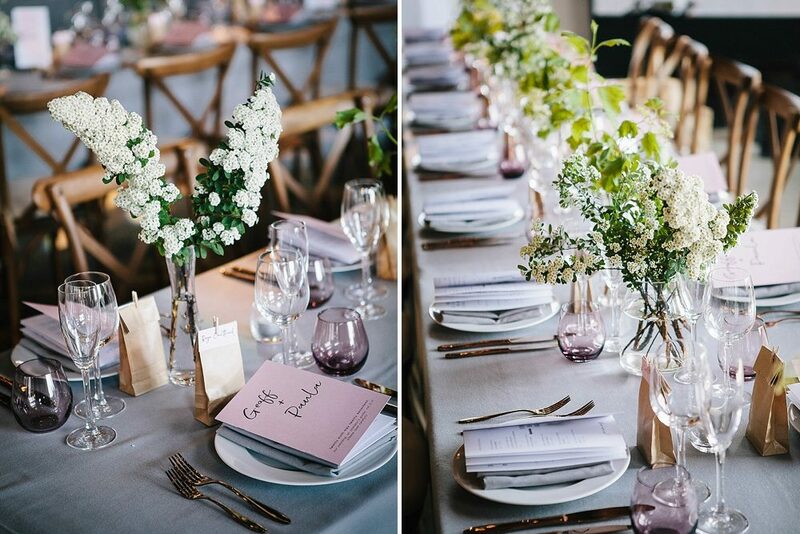 They enlisted the help of one of our all time favourite wedding planners, Liz Linkleter to help them and the results of their ideas with Liz’s vision and organisational skills are just gorgeous. 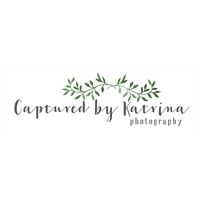 The natural, relaxed images come from My Beautiful Bride and just capture every last detail and emotion to perfection. Enjoy this one my loves, it’s not only a feast for the eyes, but Paula and Geoff’s obvious love for one another just warms the soul too. The dreamy images come from Frances Sales, whose golden hour portrait shots of Eleanor and Raphael are absolutely stunning. Enjoy this wedding lovely ones! Roshan & Lisa travelled over from Sri Lanka & held their wedding at the fabulous Trinity Buoy Wharf in London. 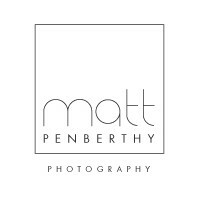 If you’re not familiar with the venue, it’s a stunning dry hire warehouse with a pretty wooden ceiling that you can fill to your hearts desire with decor and details to suit your theme, it’s right next to the river Thames too with absolutely stunning views of London, making the perfect spot for couples portraits, as you’ll see captured beautifully by Matt Penberthy. In this case the theme was fabulously fun & tropical, with tons of fairy lights and a giant disco ball hanging from the rafters. The centrepieces consisted of botanical leaves, pineapples and gorgeous wedding stationery made by a friend, and have undoubtably put a huge smile on our faces (you know how we feel about pineapples). 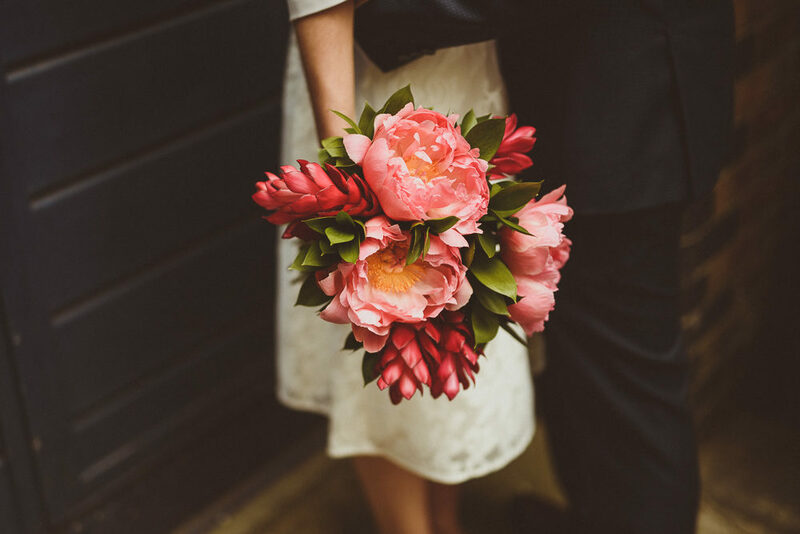 Bride Lisa looks stunning in separates from Ted Baker, with her Irregular Choice shoes adding the perfect finishing touch to her sweet outfit, not forgetting her delicious colour popping peony bouquet of course. 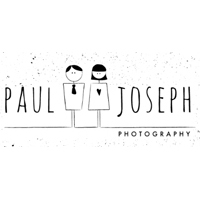 “Adrian and I wanted a relaxed wedding, we didn’t want too many formalities but more of a party!” And with a venue like Trinity Buoy Wharf in London, Pizzas from Baz and Fed, and a music set from DJ Luck & MC Neat you can just imagine what a unfussy and fun party it was too. Bride Claudia wore the most beautiful Nuria gown from Luella’s Bridal Boutique with beaded cap sleeves, I can just picture how fabulously the embellishment shimmied whilst she dance the night away, and under a ceiling full of festoon lights too. Just magical. You have to check out the adorable bride & groom sweetheart table too laden with beautiful blooms, a crown and marquee LOVE lights. What an intimate spot to sit with your new partner. All of this and more has been captured by Story and Colour. Enjoy. 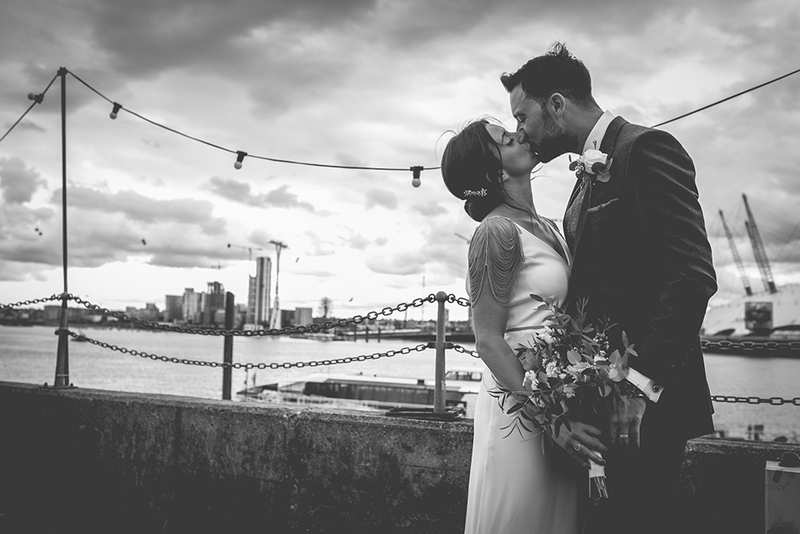 I love seeing weddings from Trinity Buoy Wharf because the blank canvas events space is always transformed SO differently by each and every couple. Holly and Steve have added a vibrant palette of bold colours, balloons, a giant disco ball and some quirky vintage details as a nod to their 50s inspired theme. It looks fabulous – fun, fresh and definitely somewhere you’d want to party the night away. How cool do Jules & Tom look? Their wedding day looks like such fun and is definitely one of those celebrations we’re wishing we had attended! The decor is amazing – dreamcatchers, glitter dipped feathers and a huge floral arch under which the couple married, there’s a distinct 70s vibe about the whole thing and I really love it. Then the’s the fashion – oh my goodness the FASHION. The bridesmaids look gorgeous in mismatched gowns with various levels of sequin embellishment. Tom is rocking a burgundy suit, one of our favourite colours for the boys. And then there’s Jules, who looks like a total babe in Grace Loves Lace combined with an oversized floral crown. It’s like Bridal separates were invented for her and it’s the perfect look for her and Tom’s stylish and informal wedding day. 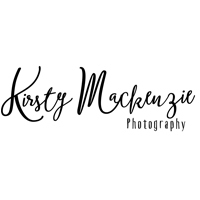 Images come from Kirsty Mackenzie photographer, who has captured some genius couple shots through the glass of the lookout tower, along with a first look that will melt your heart. Enjoy this one everybody, it’s a cracker!